I began this dress in May of 2010 and it didn’t take long to make—but I never finished it. I had a vague sketch that I’d drawn to guide me, but it wasn’t based on any particular historic fashion plate, and as a result, the dress ended up very plain—far too severe for the extravagant era it was supposed to be from. I used Truly Victorian patterns for all of it, modifying them only slightly to get the final look. 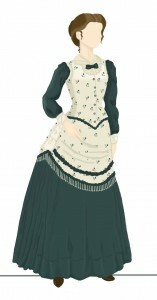 It has a trained skirt that can be buttoned up to walking length, a bustled overskirt with a simulated double apron, and a high-necked, long sleeved two-toned bodice with a double collar and matching cuffs. I like the colors and the way it’s trimmed, but quite frankly, it’s boring. Besides that, I can’t tolerate the high neck and collar. It feels claustrophobic to me. Aside from the design flaws, I never finished trimming the dress. I added a beaded fringe and an ivory braid, but it needs a lace jabot at the collar, as well as a bow. It needs lace fans sewn into the sleeve cuffs. And it needs the hook and eye closure completely redone. I’d intended to put non-functioning buttons down the front, but accidentally gave it a center-front hooking closure, which means any buttons added will be off-center. I had deliberated whether to scrap the entire bodice and start fresh with what bits and pieces of fabric I had left, or whether to work with what I had. 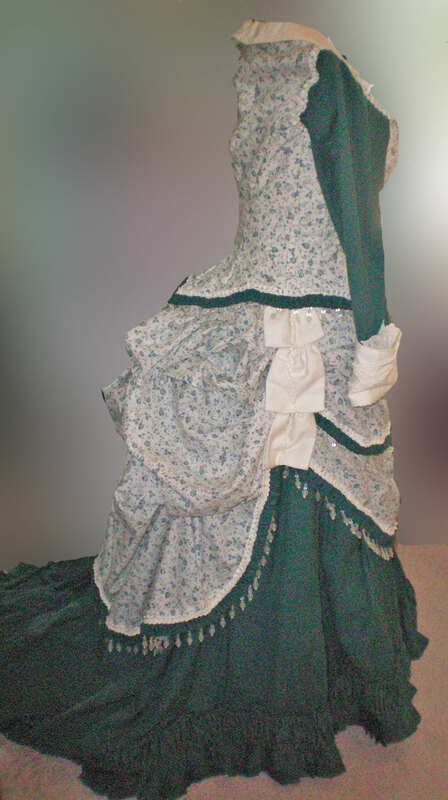 In the end, I decided to refashion what I already have, using this fashion plate as inspiration. 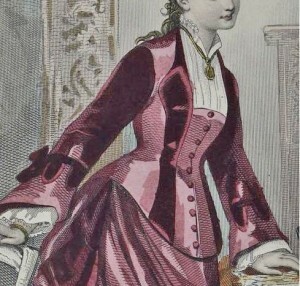 Once again, this has a high neck, but it appears to be an inserted chemisette rather than the bodice itself. What I may do is raise the square neckline enough to be modest and leave off the chemisette entirely. If I do make it, it will be extremely lightweight, made of voile or lawn, something sheer. I like that the bodice is two-toned, so I’ll keep the sleeves I already have, line them to give them some body, and perhaps change the cuffs to reflect the belled cuffs of the fashion plate. 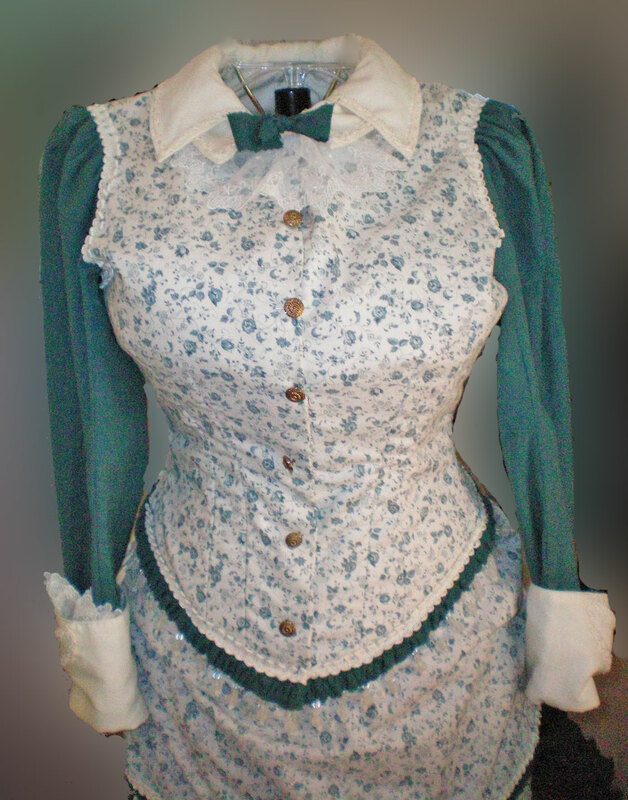 I’ll add the lapels that run the length of the bodice, and change the closure so it works with buttons. What do you think—is the new design better than the old? Would you bother remaking it? This entry was posted in Wednesday's Projects and tagged Victorian, Wednesday. Bookmark the permalink.